Playing with number puzzles and games will increase your skills and knowledge in math numbers. Examples on number puzzles and games will help you understand the tricky magic games. 1. 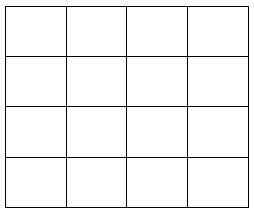 Complete the magic square given below so that the sum of the numbers in each row or in each column or along each diagonal is fifteen. The number in the lower-right corner = 15 - (6 + 5) = 4. Fill this number in the cell. The number in the lower-middle cell = 15 - (1 + 5) = 9. Fill this number in the cell. The number in the lower-left corner = 15 - (9 + 4) = 2. Fill this number in the cell. The number in the middle-left cell = 15 - (6 + 2) = 7. Fill this number in the cell. The number in the upper-right corner = 15 - (6 + 1) = 8. Fill this number in the cell. The number in the middle-right cell = 15 - (7 + 5) =3. Fill this number in the cell. 2. Insert the eight four-digit numbers in the 4 × 4 grid, four reading across and four reading down. We begin with selecting the two numbers which have the same first digit. Such numbers are 6193 and 6528. Place any of these numbers (say 6193) in the top row. Then, the other number (6528) will appear in the leftmost column. The number 1476 will appear in the second left column. The number 9132 will appear in the third left column and the number 3751 will appear in the rightmost column. The grid will then appear as shown alongside. 3. In the following problem, replace the letters of the English alphabet by digits (two or more letters may have the same value) to complete the procedure of division. 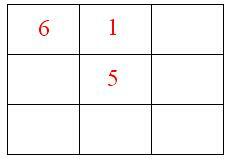 In the quotient, the first number is 5 and we know that 9 × 5 = 45. Therefore, D = 4 and E = 5. Also, to make the number 3F to be divisible by 9 we must have F = 6. And so, C = 4 and B = 6. Also, G = 3, H = 6. 4. 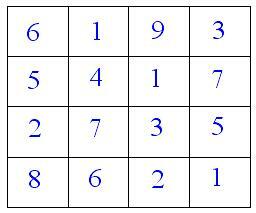 Fill in the numbers from 1 to 6 (without repetition) so that each side of the magic triangle adds up to 12. 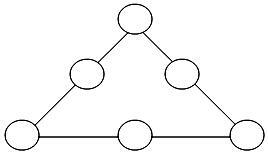 Place the largest numbers, i.e., 4, 5 and 6, at the three corners of the triangle. 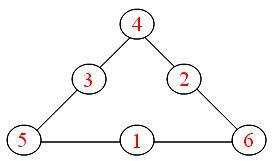 Therefore, by placing 3 between 4 and 5, 2 between 4 and 6, and 1 between 5 and 6 we get the desired magic triangle. 5. Ask a friend to write any number ‘a’. Again, ask him to write any other number ‘b’. Add the two numbers to get the 3rd number. To this (third) number add the number ‘b’. You thus get the 4th number. To this (fourth) number add the 3rd number so as to get the 5th number. Add the 4th and the 5th numbers to get the 6th number. Continue the process till you reach the 10th number. Ask your friend to calculate the sum of all the 10 numbers you obtained. You can solve it before anyone else. How? Let the first two numbers be 13 and 16. 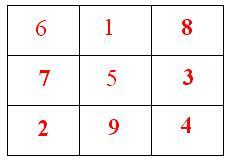 You can obtain the sum simply by multiplying the seventh numbers, i.e., 193, by 11. Note: Such numbers are called Fibonacci numbers. (13a + 21b), (21a + 34b). Adding all these numbers we get the sum (55a + 88b) which is equal to 1 1(5a +8b), i.e., 11 times the seventh number.